The holidays are approaching and the scramble to find the perfect gift for your friends is on. They say this is the season of giving, so why not give back to charitable organizations and give your friends and family an alternative gift this year via WeChat? The Nature Conservancy works around the world to protect ecologically important lands and waters for nature and people. By following its official account, you can view beautiful nature photos and learn more about habitats and animals. You can also donate directly to The Nature Conservancy, purchase an honorary tribute gift, or plant a billion trees on earth. 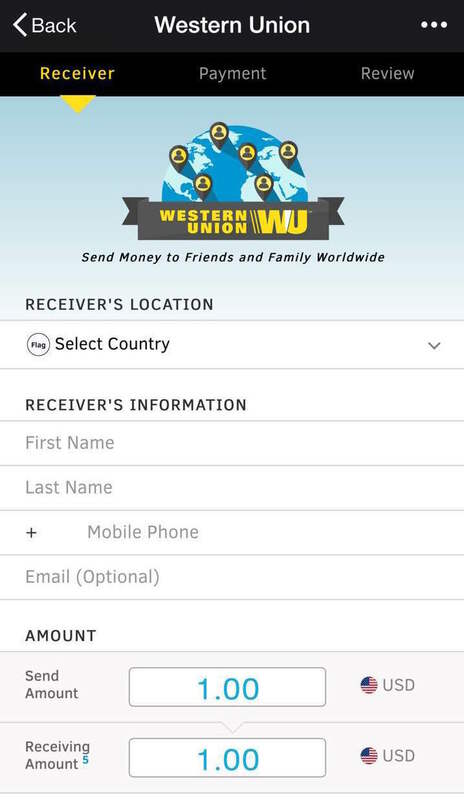 WeChat has partnered with Western Union, a leader in global payment services, to offer WeChat users in the United States the ability to send and receive money cross-border to 200 countries and territories via the company’s WU Connect platform. The partnership marks WeChat as the first social communication application to provide a technology platform to support person-to-person cross-border money transfer capabilities to more than 200 countries and territories. The capability is now available to WeChat users in the United States, with planned rollouts to additional countries in the future. Soccer season is heating up and we know you’re sitting at the edge of your seats. 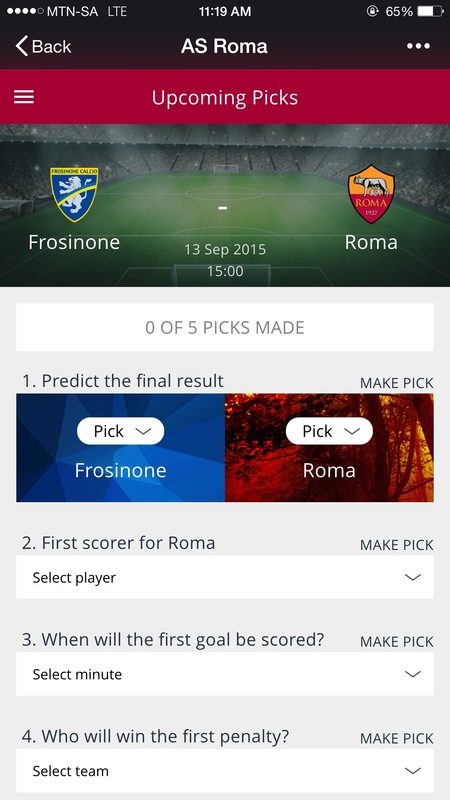 So we’ve partnered with A.S. Roma to create an Official Account that keeps you up to date on the latest from the club. By following either the English/Italian or Chinese Official Account, you’ll be able to receive daily club news, watch exclusive videos, share photos, and listen to Roma Radio. The highlight of the Official Account is a new fan prediction game. 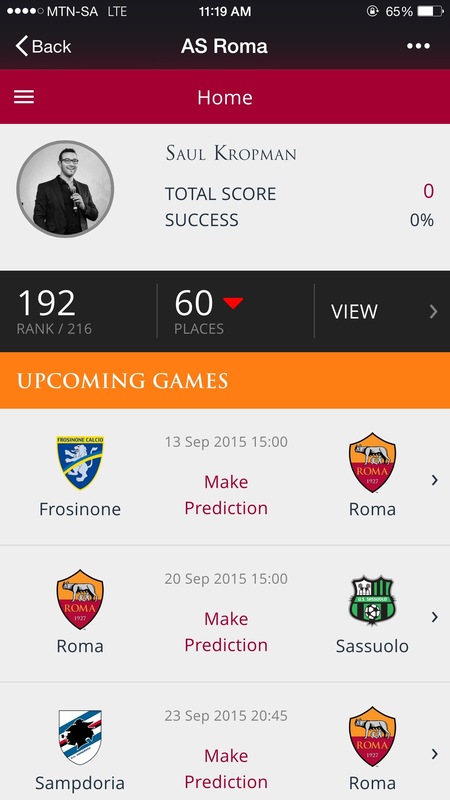 Before each A.S. Roma game, fans are able to predict the outcome of 15 individual events. They are then awarded between 100-1,000 points for each correct prediction with the highest point earners making it to the top of the leaderboard. The 15 predictions, which range from guessing the half-time score to how many penalties may occur in a game, are split between pre-game, in-game and at half-time. 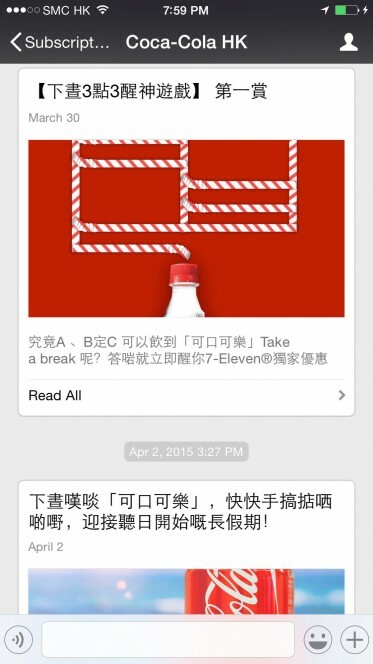 Users are utilizing WeChat for more than just messaging and brands are using official accounts in new and different ways to make users’ lives easier every day. We’ve scoured the globe and brought you a few examples of ways brands are helping users embrace the WeChat lifestyle and helping them make payments, shop online or talk about their favorite TV show all within one app – WeChat. By scanning a room-specific QR code, WeChatters were able to connect to the suite and control various aspects of the room remotely through their phones via WeChat. Imagine walking into your hotel room after a big day out and being able to switch on the lights, open the blinds and curtains and play with the room temperature, all from the comfort of your couch or bed. This and more is possible at the LINQ Hotel connected suite where WeChatters can also control how devices interact with each other. For example, users can pre-program the “sleep” scenario on WeChat so that once selected, the room automatically switches off the lights, closes the blinds and curtains and locks the door. Are you looking to be more active in your day-to-day routine? 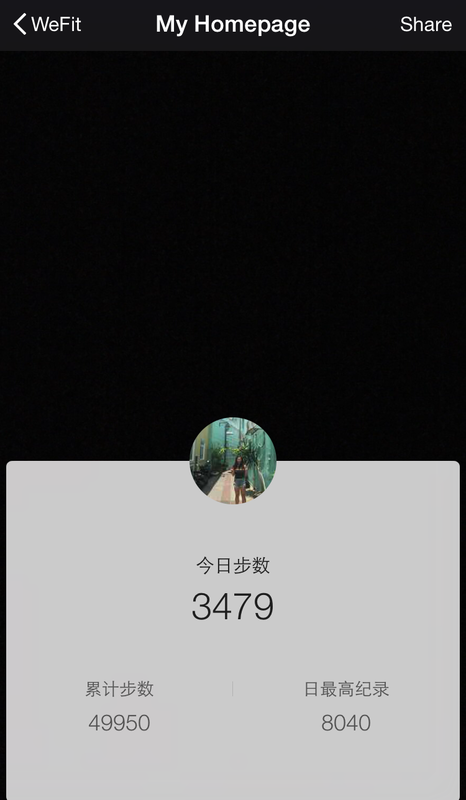 To help you get there, we created the WeRun-WeChat official account, where you’ll be able to know exactly how many strides you have taken every day and see how you match up to your friends on WeChat who follow the official account. With your permission, the WeRun-WeChat official account records the number of steps you take a day. You will also receive a daily message notifying how far you are to reaching your goal. 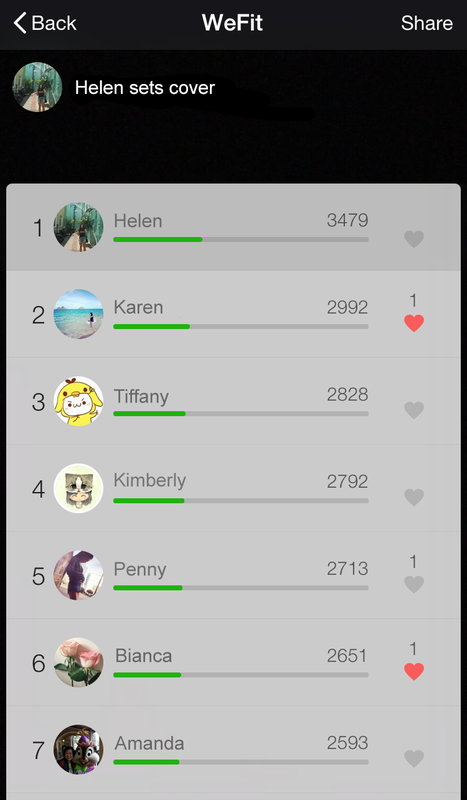 If friendly competition helps motivate you, you can see how you stack up on your daily leaderboard. No matter how you rank, you’ll be able like your friends’ steps, share your results to chats, and even publish them on Moments. With the support of WeChat, the Hong Kong Committee for UNICEF (UNICEF HK) introduces a new payment channel to support world emergency relief work via WeChat’s advanced Payment Platform. This innovative partnership will enable donors to make contributions to emergency relief efforts on their smartphones simply and efficiently. 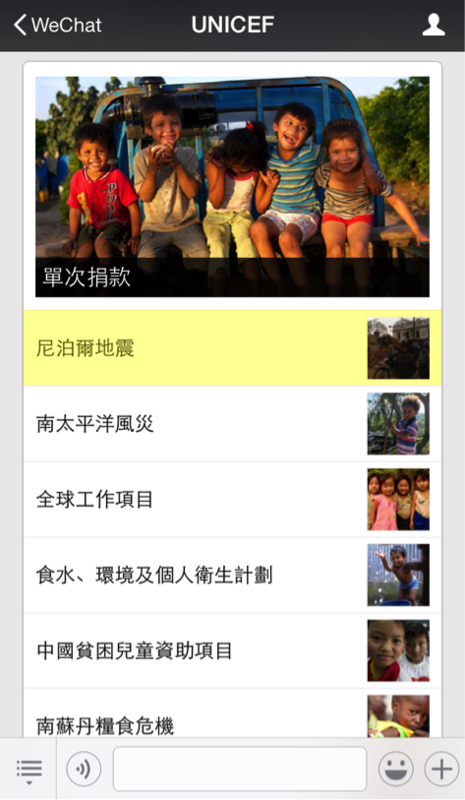 The new WeChat donation function supports UNICEF’s recent initiatives, such as the Cyclone Pam situation in Vanuatu, the ongoing Syria crisis and the recent Nepal Earthquake. By improving fundraising efficiency, WeChat and UNICEF are empowering millennials to become more involved in relief work and to give back to the global community. “Social media is now indispensable for youth. The introduction of WeChat Payment will help cultivate support for UNICEF HK from youngsters and provide a more convenient and effective channel for public donations, supporting UNICEF’s humanitarian relief work,” said Mr. David Fong, Chairman of the Fundraising Committee of UNICEF HK. 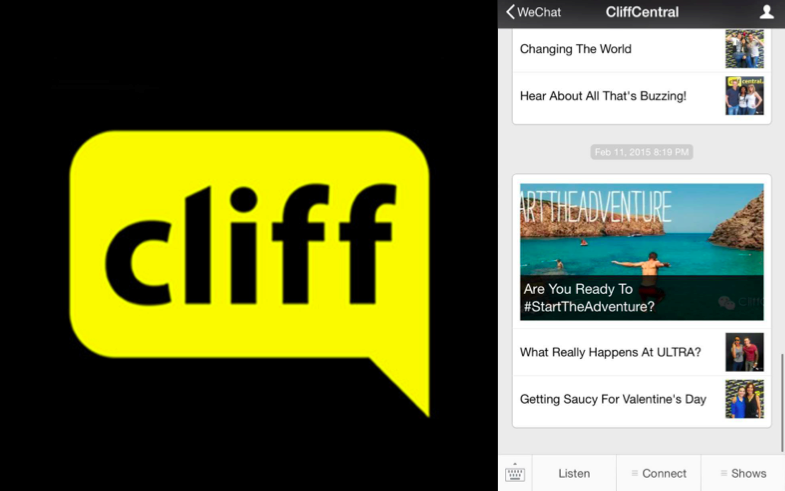 One year ago, we took a big step in our mission and launched CliffCentral on WeChat. It has been an exciting journey since then, and we’ve accomplished more than we could have imagined. As we celebrate CliffCentral’s first year, we can’t help but to reflect on all of their amazing achievements. 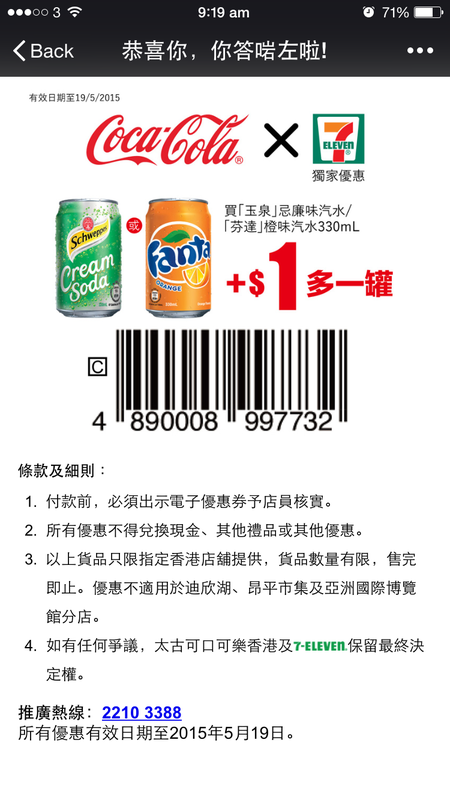 Here at WeChat, we’re all about sharing the happiness – just like Coca-Cola®! That’s why Coca-Cola® is encouraging WeChatters in Hong Kong to sit back, relax, and take a break with their new official account. From now until May 19, Coca-Cola® will be pushing messages to their official account followers at 3:15pm on a few random days per week. By answering the fun and easy questions directly in their official account and participating in the mini-games, participants will have a chance to receive 7-Eleven offers with the correct answers. With the recent outbreak of Swine Flu (H1N1) in India, national health agencies and non-profit organizations are working tirelessly to try to contain the spread of this infectious disease. 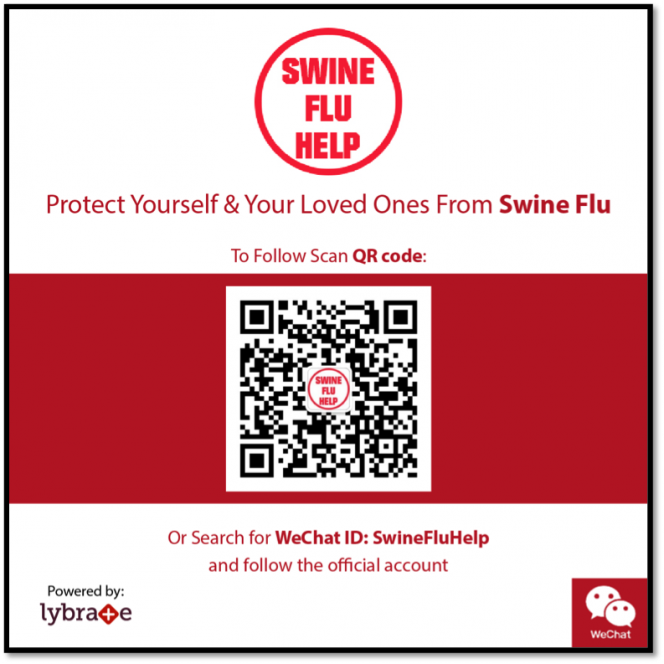 To help drive awareness, WeChat has launched the official account “Swine Flu Help” – powered by Lybrate. Through three key features of the official account, users will be able to receive daily updates about the disease and its treatment. Under the “Info” tab, users will be able to read all about Swine Flu, its symptoms, how to prevent it, and treatment options for anyone infected with the disease. Under the “Get Help” tab, users will have direct access to trusted doctors through the Lybrate website. They will be able to receive answers to any health questions they have within 24 hours. Everyone could use extra cash and WeChat’s recent strategic investment in M4JAM (Money for Jam), a microjobbing service, will help you do exactly that. Launched in August 2014, M4JAM has grown quickly in South Africa through its promise of ‘Easy Work. Easy Money’ and is now preparing to expand globally. Andre Hugo, co-founder and Chief Jammer at M4JAM, says they are ready to focus on creating even more jobs across different sectors globally with the support of WeChat. “With the opportunity to earn extra cash and supplement their incomes, our jobbers are strongly invested in our platform, providing real insights, in real-time and solving real business issues for companies. This begs the question of brands – can we afford not to be on-board?” Hugo says. The jobber’s quality of work determines their M4JAM’s jobber rankings. A higher rank helps to get higher paying jobs, leading to more extra cash. WeChat is once again proving how it can bring the on and offline worlds together, by taking on the world of exhibitions in South Africa. The Dinos Alive Play Park, with dinosaur rides, animatronic dinosaurs and educational opportunities for children, has integrated a WeChat OA into the experience to change the way consumers engage with exhibitions. 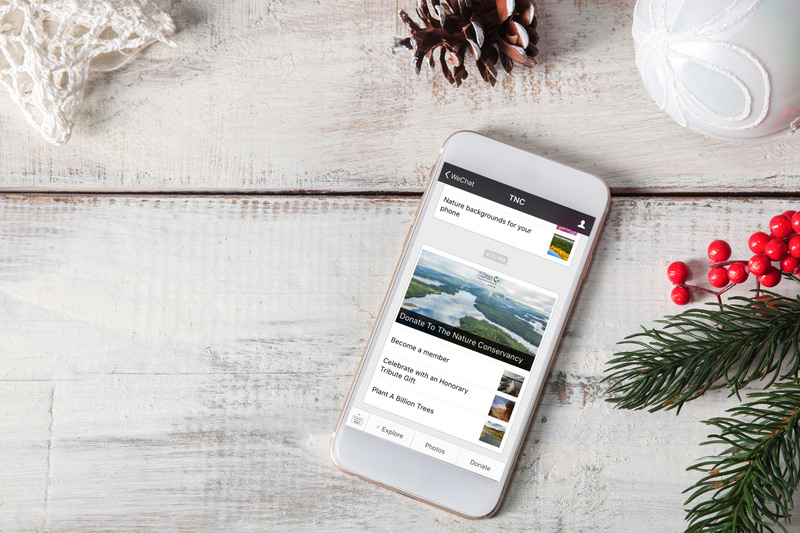 Visitors can receive all the information they need to know about the event in one central location on their mobile phones – simply by logging on to WeChat and following the DinosAlive official account. For all our WeChatters in Malaysia, we have good news. WeChat is now partnering with Malaysian telecommunications giant Digi Telecommunications to provide an easier way for Digi customers to manage their account and services straight from their mobile device. 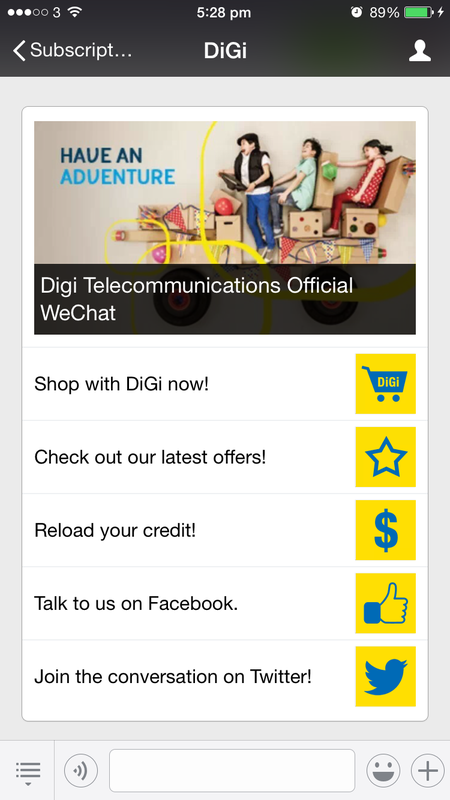 Check out all the features of the new Digi WeChat official account below. When you’re WeChatting away, the last thing you want to do is leave a chat to check on your mobile account details. 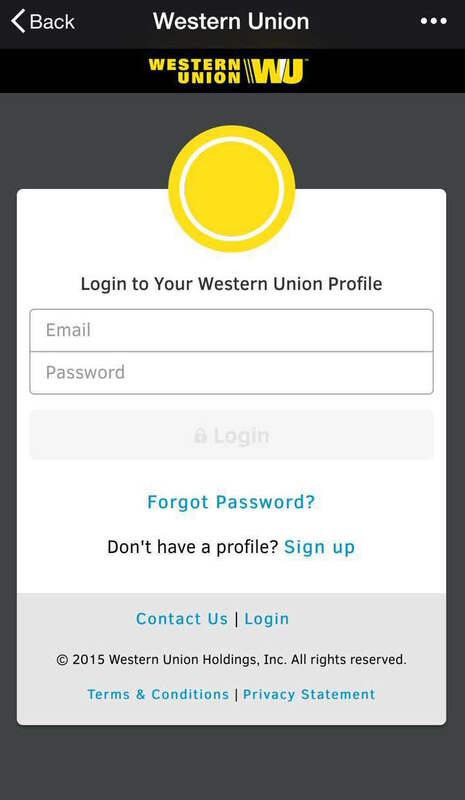 By following the Digi official account, users are able to check their personal account status, purchase additional data, gain access to exclusive rewards, as well as send feedback to Digi’s customer service team. 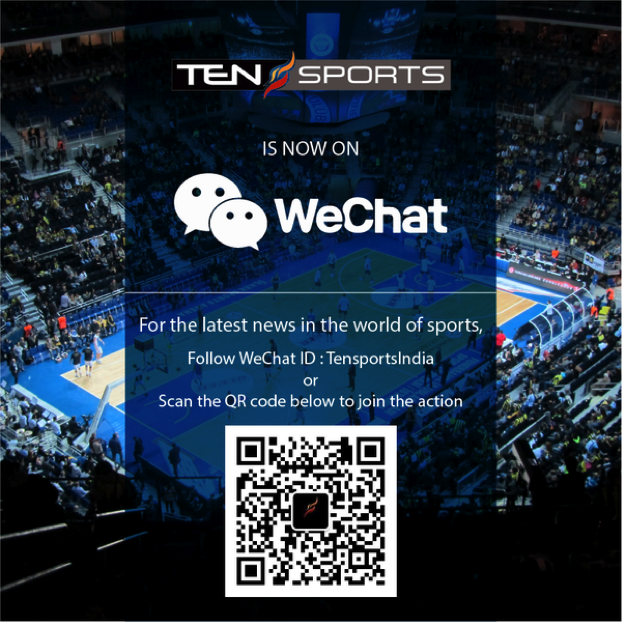 Ten Sports, the most popular sports channel in India has launched their official account on WeChat. If you’re an avid sports fan wanting all the latest news on football, tennis, golf and WWE (among many other sports) – then the Ten Sports official account is the place for you. By following WeChat Official accounts, WeChatters have access to some nifty features to keep up to date with all the action and entertainment in the world of sports, fashion, news, and events, just to name a few. Combine WeChat and Sunburn, the biggest electronic dance music festival in Asia, and you have one amazing experience. This year, by partnering with WeChat, Sunburn was able to push the boundaries yet again, creating a unique communication platform for festivalgoers through the launch of its official account. 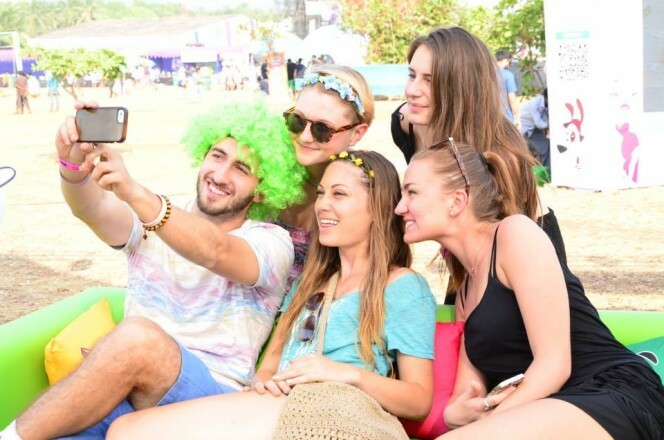 Fans were treated to three days of action filled fun in Vagator, Goa, with performances from headliners including Knife Party, Krewella, Sander van Doorn, and Danny Avila. Through the Official Account, followers were able to keep in touch with event organizers, connect with other fans and receive all the latest updates for the best experience. Whether it’s through sharing Moments, sending Sights, versing a friend in a favorite WeChat game or just chatting with loved ones, there’s no question – WeChat is helping users to connect their online and offline worlds in more ways than any other chat app in the market. And now, WeChat is bringing you the ultimate feature to help merge your worlds, the ability to control your smart room all from the palm of your hand. 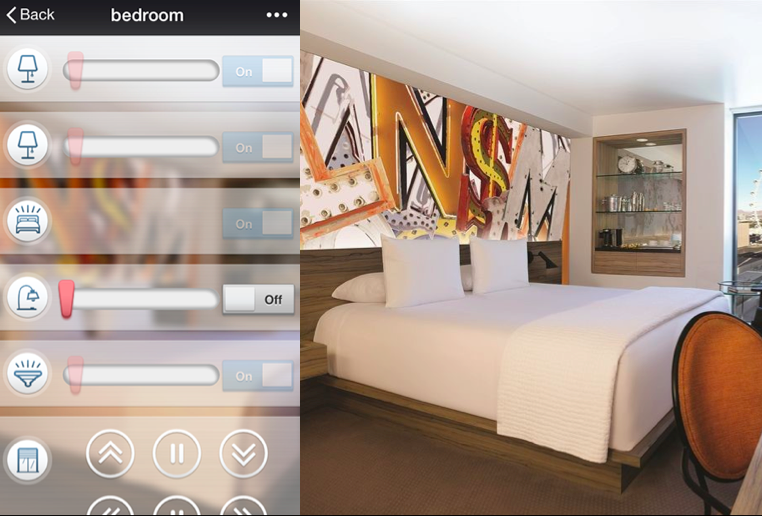 During this year’s Consumer Electronics Show (CES) in Las Vegas, we partnered with Ayla Networks and Caesar’s LINQ Hotel & Casino to showcase the first connected suite in Las Vegas. By scanning a room-specific QR code, WeChatters were able to connect to the suite and control various aspects of the room remotely through their phones via WeChat.